This Instant Pot Shrimp and Grits recipe is adapted from my own stove-top recipe for shrimp and grits that I’ve been making since I lived in the South. I may have moved out west, but I still get a hankering for Southern shrimp & grits every few months! If you’re wondering what grits are, they’re coarsely ground dried corn, similar to Italian polenta. Originally served as a breakfast dish in the Southeastern US, shrimp and grits has gained in popularity on restaurant dinner menus. There are probably as many variations of shrimp & grits as there are restaurants serving the dish. I’ve had shrimp and grits without tomatoes, with mushrooms, with cheese, or with andouille sausage or chorizo instead of bacon. Some versions are simple with just salt and pepper for spice and other versions use more bold flavorings. My version is not the salt and pepper kind! 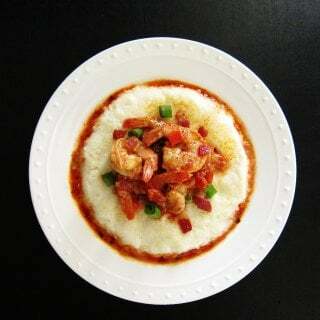 It has spice-rubbed shrimp in a rich tomato-based sauce served on a bed of creamy grits. In adapting the recipe to the Instant Pot, I wanted to make the dish a one-pot meal with as few steps as possible. The dish is easy to make: of the 45 minutes of cooking time, less than 10 minutes are hands-on. The end result is a wonderfully flavorful and comforting shrimp and grits. , added in at the end. This seals in all the flavors. 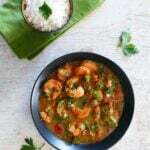 Since the shrimp cooks in the residual heat of the Instant Pot, make sure you close the Instant Pot immediately after adding the shrimp – you don’t want to let too much heat escape! I hope you get to try out this Instant Pot Shrimp and Grits recipe. 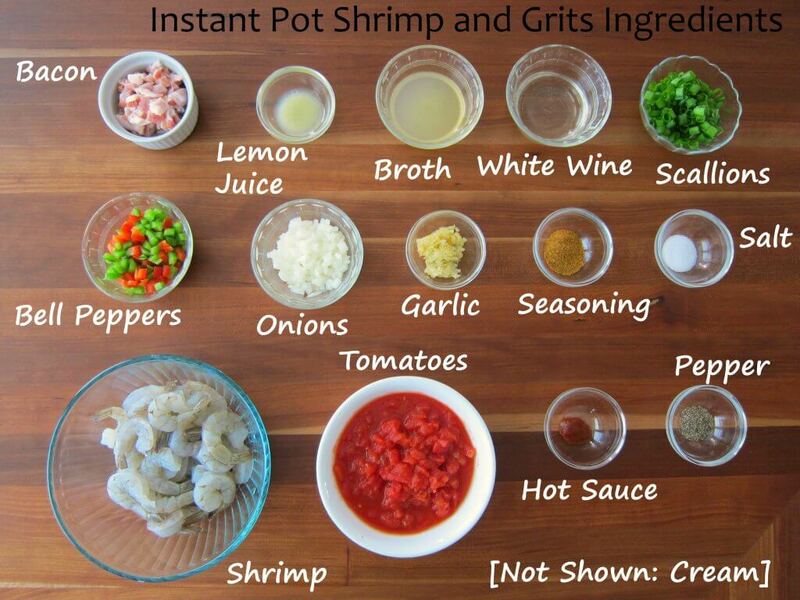 If you’ve never tried grits, this is the way to try them because they go so well with the shrimp. It’s a meal-in-one that’s delicious and satisfying. It’s not easy finding authentic stone-ground southern style grits where I live. The best option I’ve found is this kind of grits. that’s placed on a trivet in the sauce, and cook both together. The steam from the sauce will build pressure and cook the grits. Depending on the quantity of grits I’m making, they can be lumpy when finished cooking. I usually don’t have a problem if I make the recipe as written but when I double it, I need to break up the lumps with a fork once cooking has completed. If the grits seem too liquidy when you take them out, they will thicken if you let them sit for 15 minutes or so. , which I feel is just the right size. The lemon juice gives this recipe a slightly tart flavor. If you wish, you can reduce the quantity of lemon juice. The spice level is mild to medium. If you like spicy foods, you can increase the quantity of Old Bay Seasoning and/or hot sauce (reduce lemon juice if your hot sauce has an acidic flavor) and also the Old Bay Seasoning. Feel free to substitute creole or cajun seasoning for the Old Bay Seasoning. and aren’t familiar with how to use it, please read the Instant Pot DUO Beginner’s Quick Start Guide or the Instant Pot ULTRA Beginner’s Quick Start Guide first and then come back here to learn how to make this Instant Pot Shrimp and Grits. 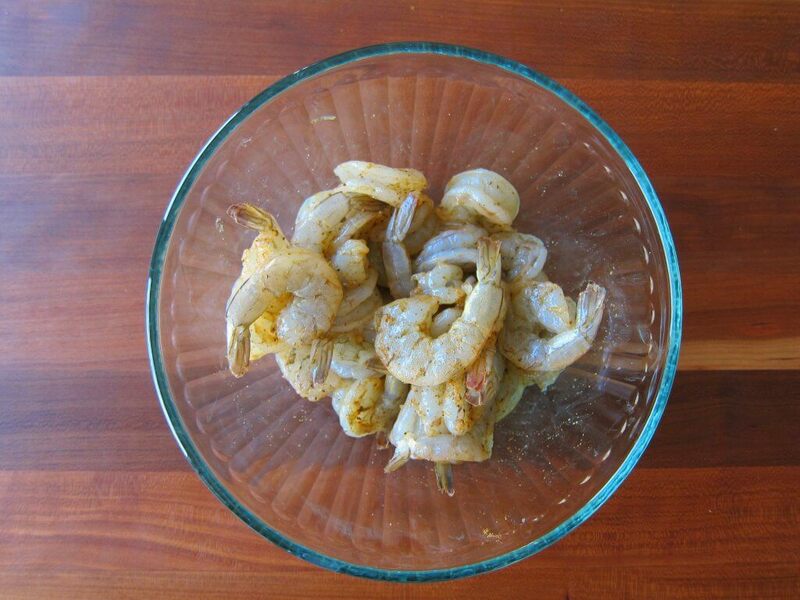 Season shrimp with Old Bay seasoning and set aside. Cook bacon until crisp, about 3 minutes. Using a slotted spoon, remove bacon to a plate and set aside. Add onions and bell peppers. Saute in the rendered bacon fat till onion is translucent, about 2 to 3 minutes. Deglaze with white wine, and stir well to remove any browned bits, allowing the wine to mostly evaporate. Add in tomatoes, lemon juice, broth, tabasco, salt and pepper. The display will count down from 10 to 0; it will switch to ‘Keep Warm’ mode and display ‘L0;00’. Do a Natural Release: wait for the float valve to drop on its own, about 15 minutes. Remove the trivet and stir in shrimp. * Be sure not to let too much heat escape while you’re removing the grits. The shrimp will be cooking in residual heat of the Instant Pot. After 10 minutes, open the Instant Pot. Add cream and gently stir the shrimp. When heated through (don’t boil), press ‘Cancel’. Remove to serving bowl and garnish with scallions and reserved bacon. 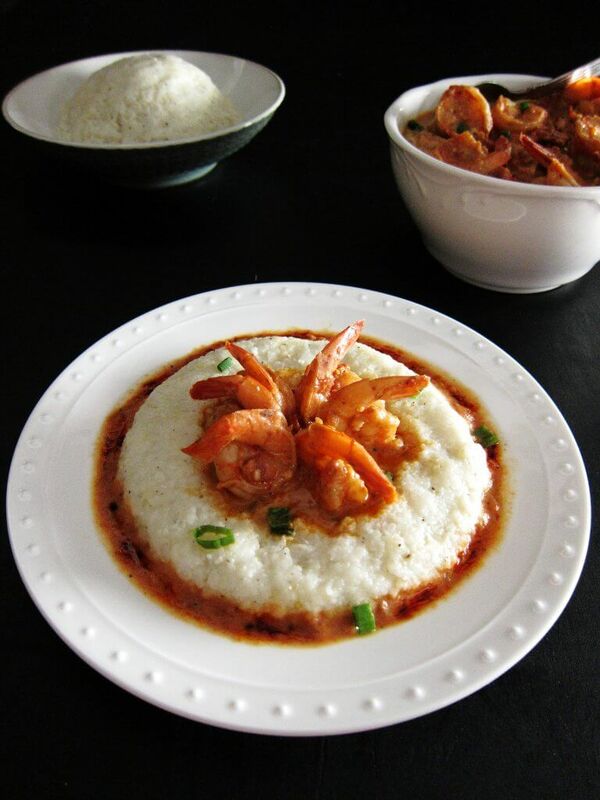 Serve grits topped with shrimp and sauce. Instant Pot Shrimp and Grits is a delightful one-pot meal. 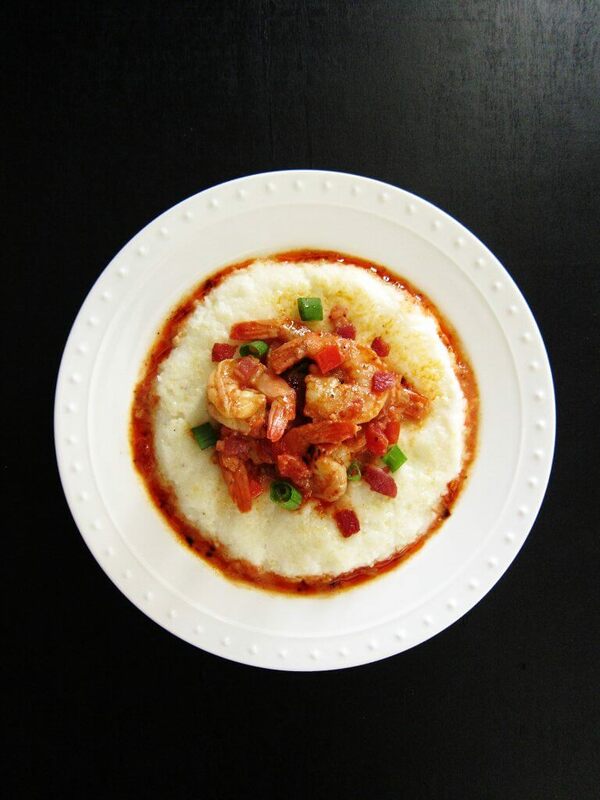 Tender shrimp and crisp bacon in a spicy tomato sauce combine with creamy grits to create a delicious fusion of flavors. Pat shrimp dry and sprinkle with Old Bay seasoning. Set aside. On 'Saute' mode, cook bacon until crisp, about 3 minutes. Using a slotted spoon, remove to a plate and set aside. Saute onions and bell peppers in the rendered bacon fat till onion is translucent, about 2 to 3 minutes. Add garlic and saute briefly. Stir in tomatoes, lemon juice, broth, hot sauce, salt and pepper. In a medium bowl that will fit in the Instant Pot, stir together grits, milk, water, salt and pepper. Place bowl on trivet. Cook on 'Manual' (or 'Pressure Cook') mode for 10 minutes. Open the Instant Pot, remove the grits and set aside. Close the Instant Pot immediately and allow the shrimp to finish cooking in the residual heat. Instant Pot will be in 'Keep Warm' mode. While shrimp is cooking, fluff grits with a fork, adding in a tablespoon of butter. After 10 minutes, open the Instant Pot. Gently stir the shrimp. Turn on 'Saute' mode and stir in cream. Heat through (don't boil) and turn off Instant Pot. Prep time does not include steps that are already accounted for in the ingredient list, e.g. chopped leeks, minced garlic, cubed carrots, etc. 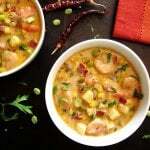 You can substitute Old Bay seasoning with any spicy seasoning like a Cajun or Creole Seasoning. Adjust the quantity of added salt as needed. Hi Lei, I haven’t tried with stainless steel, but I think it might take a little less time. If I were doing it, I would cook for the same amount of time – I’m not sure if you can overcook grits 🙂 Good luck! I made this last night and we loved it. I used half and half instead of cream and it worked out great. Awesome recipe – thanks! Hi Kristy, I’m so glad the recipe worked for you. Yes, I too use half n half sometimes. But can’t beat the taste of cream! Have you ever tried substituting scallops for the shrimp? I’m allergic to shrimp – just wondering if the scallops would cook through in the residual heat like the shrimp does? Rachel, I have not tried cooking scallops. I believe scallops take about the same time to cook as shrimp on the stovetop? If that’s the case, I would imagine it would work. Tough scallops are the worst right? So better err on the safe side. If not cooked through, try and cook for 1 minute on manual. I made this today and it was really good!! The grits were really runny when I first removed them but I covered them while the shrimp was cooking and they thickened up nicely. I’m so full right now! I will definitely make again. Hi Amy – thanks for commenting! Yes, this is a filling dish, I feel that way every time I make it! I’m really glad you liked it. Wow! These were amazing. I’ve never made grits before and it was perfect as is. Thanks for the great recipe. Thanks for the feedback, Victoria – I am glad you liked it! OMG! My first Instant pot dish and it worked ! Easy recipe to follow thanks. So glad I found it. Wanted to let you know I only had quick grits – used the 1 C water and 1C milk and they turned out just fine – in fact the best I’ve ever made. And I had no heavy cream or half and half – so I stirred in some Greek yogurt- worked! Delicious! I tossed in some pepper flakes – nice and spiced! Thanks for the comment, Lorrie. I’m so glad your first Instant Pot dish was a success. Good to know that instant/quick grits worked. Enjoy your new Instant Pot! What size Instant Pot is this recipe designed for? Would there be room to double the recipe if you were using an 8 quart instant pot? Hi Karen, I use a 6 quart. I think you will be able to double the recipe in an 8 quart. You probably know that you can keep the cooking times the same. Hope you like it Mary and let me know! Did I miss where you told us what kind of grits? Instant or regular? Hi Linda – it was in the first paragraph, where I have a link to the kind I use. I can only find Bob’s Red Mill white corn grits and that’s what I have used; they’re not instant. However, I’ve had readers use instant grits and they’re worked fine too. Made this for dinner last night and my husband says he could eat this every night. Best shrimp and grits recipe to date and we have tried many recipes. Hey Natelie – Oh wow, what a compliment! I guess it lived up to its name 🙂 Thank you so much for taking a moment to comment and review. I just got my first instant pot and tried your shrimp and grits recipe! It was sooooo delicious, thank you so much for this recipe! And I have some leftover for tomorrow, yay! Hi Juliette (love your name btw! ), you’re so welcome – I’m glad you liked it. And thanks for commenting! Do you drain the liquid from the canned dices tomatoes or use it as part of the 1 1/2 cups? Hi Janet – thanks for your question. Yes, you put the whole can of tomatoes in, in addition to the other liquids. Hope you like it! Dang!! I’ve been sitting on this recipe for a while and I should not have waited. Could have been enjoying it all this time. This was fantastic!! My husband said I need to make this again soon. 🙂 And I definitely will! What a delicious recipe! I will definitely keep this recipe and serve it for company! I think preparing the ingredients ahead of time is essential so steps can be followed quickly. Great directions with photos – very helpful. Thanks very much for posting. Hey Rita, thanks so much for commenting 🙂 You’re right, I’m such a disorganized person that this is all the more important for me! Glad you liked the recipe. I just made this dish in my new Instant Pot. I’ve never made shrimp & grits before & was not disappointed… easy & delicious!! The sauce is so wonderful. Next time I will add cheese to the grits to make it even more decadent. My one question is re: an alternate cooking technique for the grits that I found, cooking them with the water only, then stirring in the milk at the end. Have you tried it that way? Hi Cindy, I’ve not tried that, but wonder how you prevent it from being too liquidy? I suppose you don’t have to use milk at all, but it will lack that creamy quality… I’m so glad you liked the recipe. Hi! When you cook the grits, is there water under the stainless bowl? Thanks! Hi Mark, if you’re following my instructions for Shrimp and Grits, then no, you don’t need water because the tomato base/sauce provides the steam to cook the grits! If you wanted to cook just grits alone using the Pot in Pot technique, then yes, you would add water below the trivet. Thanks for your question. This looks yummy! Could I use frozen shrimp and either sauté them longer or pressure cook for a few min? Or do you recommend the shrimp be thawed first? Thanks! Hi Julie – if the shrimp are frozen, why don’t you try and do a 1-minute pressure cook and quick release? I think that’ll work – haven’t done it for this recipe but have used frozen shrimp in other recipes. Hope you like it. I had shrimp and grits for the first time when I was in Savannah this past spring and have been craving them ever since. Was happy to find this recipe. It was easy to follow and they turned out great! I added chorizo sausage and made double the grits. My grits were a bit runny, but all in all very good! I’m glad you liked it, Alec. The grits being runny could be due to using a different brand than me. Next time, add a bit less liquid if you use the same brand. Thank you for taking the time to comment! Hi Whitney, no I’ve not changed the recipe – it’s the same as I always make it. You could try this recipe and use sausage instead of bacon. It’s an excellent recipe. I made this today, which was Thanksgiving Day 2018, for my husband and myself for brunch before going to a friend’s house in the late afternoon for the big dinner. It turned out so well and I will definitely make this again. It’s one of my favorite recipes, Laurie! So comforting. Thanks for the comment and rating! I made this, but used ghee rather than butter, added more bacon, wine, & Tabasco, and added half a Serrano chili pepper & some tomato paste. 👍🏼👍🏼, but I think it still needs more heat! Maybe smoked Tabasco? Kristen, unlike Cajun dishes, my shrimp and grits recipes aren’t too spicy so you can definitely add more heat like you did. I would just add some extra cayenne with the Old Bay seasoning. Made this for dinner tonight….my hubby said it was restaurant quality. Could it be because I didn’t have milk so I used heavy cream for the grits👨‍🍳 🤣😂. Wasn’t sure how big of a bowl to use for the grits and all I had were the round Pyrex so I used the smallest 1qt size and it was perfect. Grits didn’t explode everywhere as I wasn’t sure how much it would rise. Also just as another reviewer said grits were a little runny at first but setup nicely as I waited for the shrimp to cook. Recipe is definitely a keeper. Next time I will try adding some sausage. Thanks for the great recipe! Hi Angie, that’s funny – cream does make anything taste even better 🙂 Thank you for your comment and I so happy to hear you liked one of my favorite recipes. Sausage would be a nice and substantial addition. For some reason I have had a taste for shrimp and grits and the only wsy to get them was to make them myself. I love cooking in my pressure cooker so of course I had to find a recipe that used a pc, and ingredients I had on hand. This one was perfect. The first time I made them I just used 1/2 the recipe because I was only making for myself. It came out so good, and I had leftover shrimp and sauce so I had it over rice. And it was just as good or even better. My husband had a taste and asked me to make more. So within 1 week, I made this twice. Both times it came out perfect. Thank you for sharing your rcipr for this delicious dish. I am not sure what I did wrong but this recipe did not turn out as well as the others. We used Autry grits the only difference. No flavor in the sauce just blah . My husband was so excited to have this Shrimp and grits as it is his fav. Not this though. It took over 2hrs to prepare and cook. I don’t get the benefit of this instant pot. Christine, sorry this recipe didn’t meet your expectations. I love the flavors of this recipe, but maybe your taste buds require you to increase the quantity of spices, onions, garlic, etc. Maybe by one and a half. Do you think it will still be a good recipe if bacon is not added? I don’t eat pork. I think it will be tasty still. Maybe you can add some chipotle chile or smoked paprika for a smoky flavor and saute the onions in some butter if you don’t mind the fat. Thanks for your comment, Donna – I’m really glad you liked the recipe. 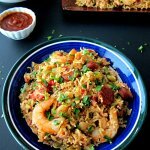 Our family enjoyed this dish to varying degrees, ranging from my youngest (a teenager) who absolutely loved it, to me who thought it was just ok. On the plus side, I thought the shrimp were cooked perfectly! My biggest complaint is that the recipe says it serves 4. Perhaps as an appetizer, but for me, as an entrée, it serves closer to 2 (perhaps 3; if I had to pick a number, I’d go with 2.25). I did not grow up on grits, but loved them when I had shrimp & grits in a restaurant in Washington D.C.; those grits were sooo creamy. These grits were not nearly as creamy and that disappointed me (if it’s easy to tweak the recipe to be creamier, might be worth a comment in the recipe). One other potential note to add to the recipe is for people to remove all the lumps when fluffing the grits. Terence, regarding the creaminess of the grits I know what you mean and that’s most likely from using cream and butter 🙂 Yes, sorry about the serving size – I usually just put down the number of servings that a recipe feeds my family – we usually have a salad, etc. So it may not be accurate for everyone. I will put it on my list to update the tips with your suggestions because they are valid points. Thanks for your feedback.